Clear Sound is excited to help bring a variety of musical events, from gospel to Broadway to the Philly Pops, to Independence Mall throughout the Wawa Welcome America Festival. We hope everyone gets a chance to join us. Clear Sound provides superior audio services to a diverse range of Philadelphia events including races, concerts, parades, meetings and graduations. Where better to spend the 4th of July than Philadelphia? Join us at Wawa Welcome America from June 28th through July 4th – Clear Sound will be providing audio at Independence Hall and the Freedom Stage. Music lovers will enjoy Aetna’s Gospel on Independence on the 1st, the Kimmel’s Broadway Philadelphia on the 2nd and the Philly Pops on the 3rd. 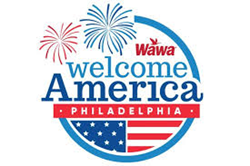 Wawa Welcome America is a multi-day festival with FREE multicultural and multigenerational events celebrating America’s birthday in America’s birthplace – Philadelphia. The citywide festival is jam packed with multiple fireworks displays, free concerts, free museum days, community events, free outdoor movie screenings, block parties and more! "We might be a little biased, but, to us, nothing says “celebration” better than live musical performances, and what could be more iconic of this country’s freedom than Independence Hall? Clear Sound is excited to help bring a variety of musical events, from gospel to Broadway to the Philly Pops, to Independence Mall throughout the Wawa Welcome America Festival. We hope everyone gets a chance to join us."